All welded heavy duty 22/20 gauge steel construction. Monitor viewable through 16"W x 15-1/2"H acrylic window. Accommodates flat screen and traditional monitors. Powder coat finish. Air-tight door seals and air-intakes for fan filter out dirt and dust preventing it from entering system. All welded steel and completely secured. Piano hinges on all doors. Four 5” casters, 2 locking. Powder coat finish. Monitor section: 25-1/2”W x 30”D x 21-1/2”H Work height: 44-1/2” Slide out keyboard tray: 24-1/2”W x 24-1/2”D Lower cabinet: 25-1/2”W x 30”D x 33-1/2”H with pull-out printer shelf. Convenient slope work surface, side shelf. 2" grommets in the bottom, sides and top for easy wire management. Bottom unit as 6" wire way with rear door access. All doors and flip-down drawer lock. 12 1/8"W x 18 7/8"D side mounting posting shelf which can be access from left or right. 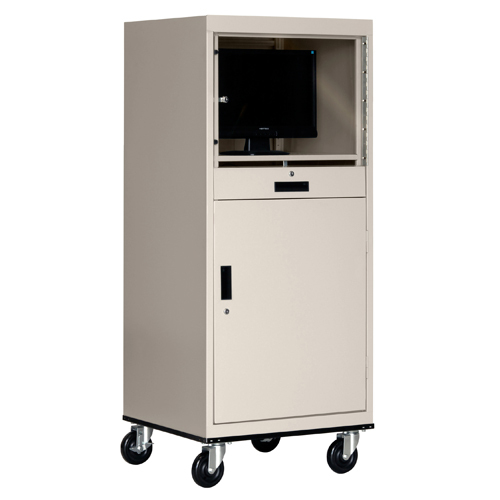 Lower compartment has an extendable printer shelf which adjusts on 3"center 20"W x 16 15/16"D. Lower compartment has a flip-down drawer front and extendable keyboard drawer 20"W x 16 3/8"D. Upper compartment has a vented back and accommodates most 24" flat screen monitors, interior size is 25 15/16"W x 10 1/2"D x 19 1/2"H. The upper compartment is equipped with a locking, poly-carbonate door, commonly known as an acrylic door. It is very durable and fully transparent. It measures 23-13/16” X 18-1/16”. It consists of a key cam lock system which allows for ease of accessibility. The acrylic door makes it easier to handle compared to heavy glass or plastic. The acrylic door is very sturdy and can withstand an impact much better than glass. It is more pliable and adds more deflection. Lower locking compartment with 1 adjustable shelf, adjusts on 1” centers is 21” x 23” x 24-1/2”. 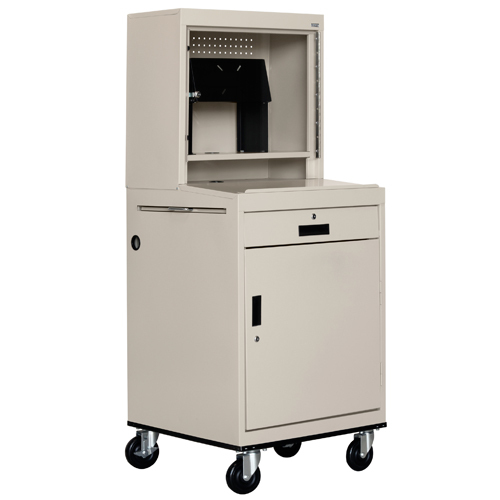 This unit has a 21 3/4"W x 3"H storage section between the upper and lower sections. This unit has a 26"W x 12"D, 10" sloped work surface. Flat panel kit included. 2” grommet in bottom shelf for easy wire management. Monitor shelf wire way in back of shelf for easy access of wiring between upper and lower portions of cabinet. 4 heavy-duty 5” casters, 2 locking. Cabinet supports 150 lbs. Keyboard shelf 20” x 15-1⁄2” x 2”. 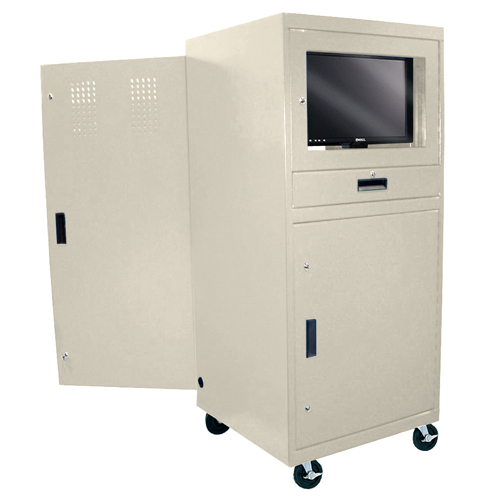 The upper compartment is equipped with a locking, poly-carbonate door, commonly known as an acrylic door. It is very durable and fully transparent. It measures 23-13/16” X 18-1/16”. It consists of a key cam lock system which allows for ease of accessibility. The acrylic door makes it easier to handle compared to heavy glass or plastic. The acrylic door is very sturdy and can withstand an impact much better than glass. It is more pliable and adds more deflection. Lower locking compartment with 1 adjustable shelf, adjusts on 1” centers is 21” x 23” x 24-1/2”. Flat panel kit included.